These are the powerful words that open director Marian Edusei's film Dark Skinned Girls, which explores the ways in which negative stereotypes around dark-skinned women permeate narratives in the black community. 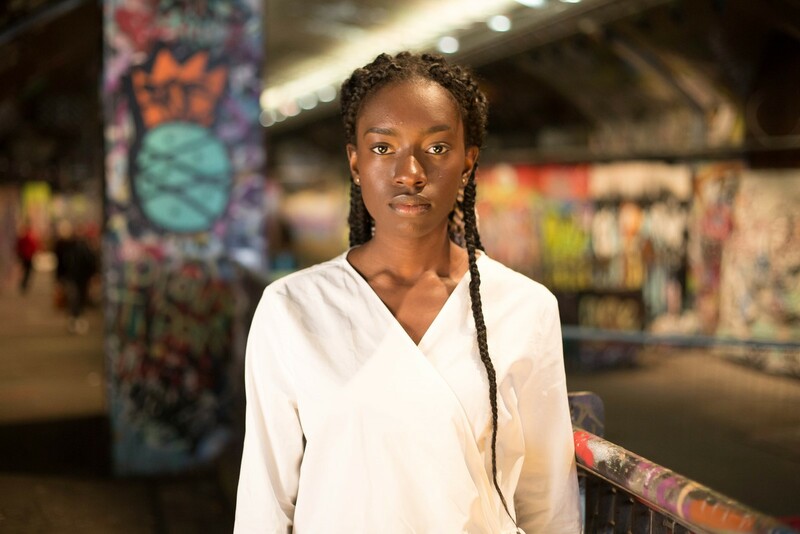 Dark-skinned black girls growing up in the UK and beyond are often seen in opposition to ‘desirable’ light-skinned black women, and as the voices in the film layer on top of each other, their ominousness becomes inescapable. This is colourism in its most brazen form: “Them dark skin girls, they ain't feminine,” says one voice. “I don't like women with my complexion,” says another. All of the statements in the video are taken from real-life incidents, and their ridiculousness is only dampened by the boldness with which the narrators say them – as if they're facts, not malicious falsehoods. Studies in the US have found that black women deemed to have a lighter skin tone received more lenient prison sentences and served less time behind bars than their dark-skinned counterparts; there are real-world consequences to colourism beyond desirability. In Nigeria, up to 77 percent of women use skin lightening products. But this is a problem which extends outside the black community. Many Asian women too have felt the pressure to be lighter; the skin bleaching industry is flourishing there too. In India marriageability for women is sometimes dictated by ‘fairness’. Understanding colourism requires a thoughtfulness beyond understanding everyday racism. Historically it has generally been helpful to have a proximity to whiteness. An oft-repeated example of this is the fact that in America ‘house slaves’ would be lighter-skinned, whereas black slaves working harder jobs in the fields tended to be darker. And now, to this day, the world over, from the U.S.A, to Egypt, to Colombia the darker you are in skin tone the more likely you are to be of a lower socio-economic status. The hierarchy of skin tone is so engrained globally that colourism is often internalized: the dictionary definition of colourism cites it as “prejudice or discrimination against individuals with a dark skin tone, typically among people of the same ethnic or racial group”. This film zeroes in on the fact that oftentimes the people being derogatory toward black women due to their skin tone are black men black men who are ironically a similar shade to the women they insult. A preference for light skinned women amongst black men was a phenomenon also highlighted in a viral video from YouTuber VanBanter, which posed the question, “Are black British youth obsessed with light skin and curly hair?” The answer, based on the responses collated for the video at least, was a resounding ‘yes’, mirrored in plays such as 2017's #HashtagLightie, which makes the point that colourism often doesn't benefit dark-skinned black women or light-skinned black women. As one of the voices in the video says obnoxiously: “(Dark-skinned women) they too tough, they too tough. Light skinned women, we can break them down more easily”. Inaccurate stereotypes don't do anyone any favours. However, what is powerful about Dark Skinned Girls is that, unlike in VanBanter's video, dark-skinned black women are given redemption. They remain voiceless but not silent. By the end of the film the women, who Marian says are “successful, striking dark-skinned women who were confident and comfortable in themselves”, are shown overcoming the prejudices that have been levelled at them. Their expressions change, their features soften and they begin to laugh. Because really, it is so ridiculous that it's funny.